This combination wedding involved a Sikh ceremony and a South Indian ceremony, both of which took place at the Beverly Hilton Hotel. The bride wore a red lengha for her Sikh ceremony, a white sari for her South Indian ceremony, and a beautiful burgundy lengha for her reception. The Indian reception took place at the Beverly Hills Hotel, and was unique in that the couple served plated French food rather than the traditional Indian buffet. I love tikka jewelry, and truly love the tikkas that involve a longer lengths of gold or jewels that wrap around a bride's head. This tikka and necklace (or set) were stunning gold creations that were handed down to the bride by her mother (who has become a good friend of mine). This five-day wedding was truly a sight to behold, and I consider myself lucky to have gotten to photograph it, as I made a lifelong friend in the process. 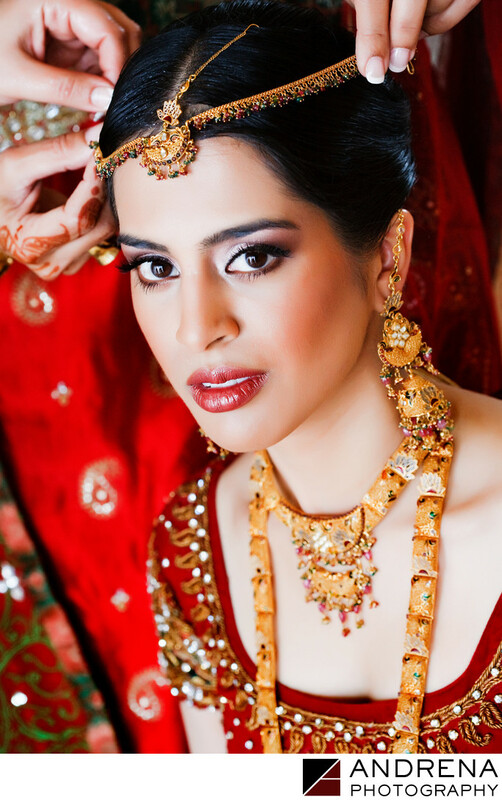 This wedding was published in South Asian Bride magazine. Fun fact: The Harvard-educated bride and groom both hold multiple degrees, and to date, I think they have the longest list of Ivy League degrees I've ever seen. Sikh and South Indian wedding photographed at the Beverly Hilton and the Beverly Hills Hotel in Beverly Hills, California.